Yup, you. The dork on the left in that picture. 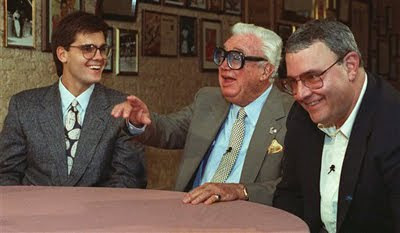 Grandson of the great Cubs announcer Harry Caray (center), and son of longtime Braves announcer Skip Caray (right). You, sir, are a jackass. For the last few years we've been exposed to your horrid, McCarver-like broadcasting skills, something you clearly missed out on when your genes were being passed out. And now, on the eve of the division series on TBS, Ted Turner is sitting in Atlanta with a cigar in his mouth, and twirling his moustache, trying to figure out which announcers he's going to send to which playoff series (I know they put Ted in charge of this stuff). And I pray that they don't send you and your over-reacting ways to southern California to commentate Sox-Angels. 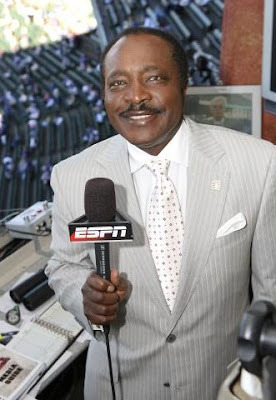 I will be forced to give you the Joe Morgan treatment and put you on mute, which only makes it more difficult for me, because then I have to make all the basebally sound effects myself. Chip, I invite you to go to hell and stay the f*ck away from my playoff baseball. LOL! Very good game last night.